If your fitness goals include building muscle and having a lean, trim body, you should think twice about indulging in alcohol. Excessive alcohol consumption affects your muscles, hormones, liver and brain in ways that are counterproductive to becoming more fit. Consuming alcohol in moderation has some positive effects on the body in the areas of stress reduction, "good" cholesterol and reduced insulin resistance. Moderation is considered no more than one alcoholic drink for women or two drinks for men per day. One of the main effects of alcohol consumption is dehydration. Muscle is composed of 75 percent water. Inadequate water intake will cause your gains in muscle strength to evaporate. 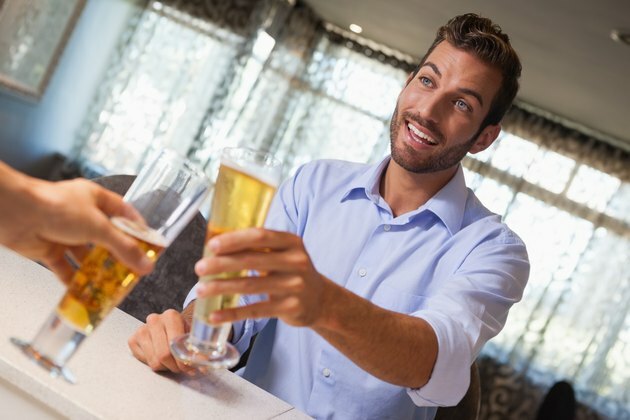 If you are training particularly hard, you should drink nearly twice the standard recommendation of eight glasses a day, according to the Bodybuilding.com website. The kidneys must filter large amounts of water to break down the alcohol, resulting in dehydration within the body. When the body is dehydrated, it can't work efficiently and unless you replenish the water, you will end up with a hangover. Fitness columnist James Jacobsen recommends matching alcohol with water, if you don't give up drinking completely. If you have one beer, you should have one glass of water. Try drinking 32 oz. of water before you go to bed. Although alcohol is a carbohydrate, it does not convert to glucose like most carbohydrates but becomes a fatty acid and is more likely to be stored as fat. If you exercise and drink alcohol, it causes your fat metabolism to be put "on hold." The caloric content of alcohol adds up to seven calories per gram. A 12-oz. beer, on average, contains around 146 calories, 13 g. of carbohydrate and a few vitamins and minerals. A shot of gin has around 110 calories. Alcohol interrupts the Kreb's Cycle, a complex series of chemical reactions in the cells, which plays an important role in fat burning. Drinking alcohol depletes vitamins A, C, B-complex, calcium, zinc and phosphorus. These vitamins and minerals are vital to your body's proper functioning, including the growth and maintenance of muscles. To compensate, if you know you are going to go out drinking, take a couple of multi-vitamins before you begin, to help replenish the vitamins you will lose from the alcohol. When weight-training, a time-released protein shake, which also contains vitamins and minerals, taken at bedtime will help keep your muscles from breaking down and assist with the rebuilding process during sleep. Drinking lowers testosterone and increases estrogen in the body. Testosterone, which is more prevalent in men, is the most important hormone in the body for building muscle. The level of free-flowing testosterone determines how much muscle a person can gain. Lowered testosterone levels have an effect on muscle mass, definition, strength and recovery rate, while increased estrogen levels cause more fat depositing and fluid retention.